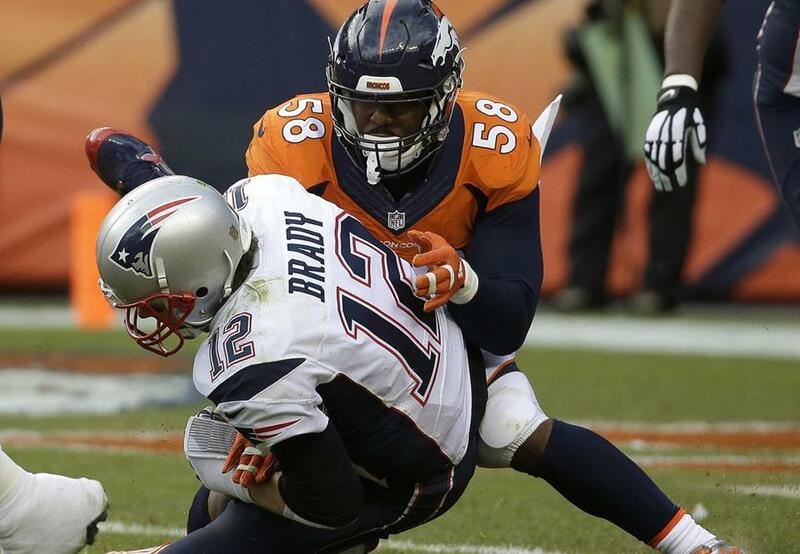 Broncos linebacker Von Miller terrorized Tom Brady in the AFC Championship game. SANTA CLARA, Calif. — It’s been more than eight years in the making. Now Von Miller stands before us having achieved his dream. Miller liked the classes so much that he became a poultry science major at A&M. Two years ago, he began Miller Farms at his house in Dallas, building a 3,000-square foot chicken coop with 35-40 chickens. He hasn’t gone commercial with his chicken farming venture yet, but envisions it becoming his lifelong career. Miller’s full-time job for now, of course, is attacking quarterbacks as the Broncos’ strongside linebacker. Miller leads the Broncos’ No. 1-ranked defense into Sunday’s Super Bowl 50 against the Panthers after wrecking the Patriots’ championship hopes with a one-interception, 2½-sack performance for the ages in the AFC title game Jan. 24. The No. 2 overall draft pick in 2011, Miller has met and exceeded expectations throughout his five NFL seasons. He’s been a Pro Bowler in his four healthy seasons (he tore his ACL in 2013), a two-time All Pro (2012, 2015) and in September became the third-fastest player in NFL history to reach 50 career sacks (58 games). Everyone loves Miller’s antics when things are going well on the field. And the 2015 season was all roses for the Broncos and Miller, who had 11 sacks and four forced fumbles during the regular season. But it wasn’t always this way. Miller, 26, has grown up a lot over the last five years. In 2013, Miller served a six-game suspension for trying to cheat an NFL drug test. He also racked up several traffic violations and gained 20 pounds after tearing his ACL in December. His parents moved in with him to keep an eye on him. “It hasn’t always been positive — it’s hasn’t always been good — but it got me to the situation and the moment I’m in right now,” Miller said of his bevavior earlier this season. Miller hasn’t had an off-field incident over the last two years, and seems to have figured out the right balance of goofing off and taking life seriously. Of course, it doesn’t hurt that he’s set to become an unrestricted free agent and could make upward of $50 million guaranteed if the Broncos don’t use the franchise tag on him. The last time the Broncos were in the Super Bowl, two years ago, Miller watched from the sideline thanks to his torn ACL. He badly wants to make an impact this time around, and certainly won’t curtail his antics.